This is another legal pot here on Glen Road that needs to have plants placed inside of it. 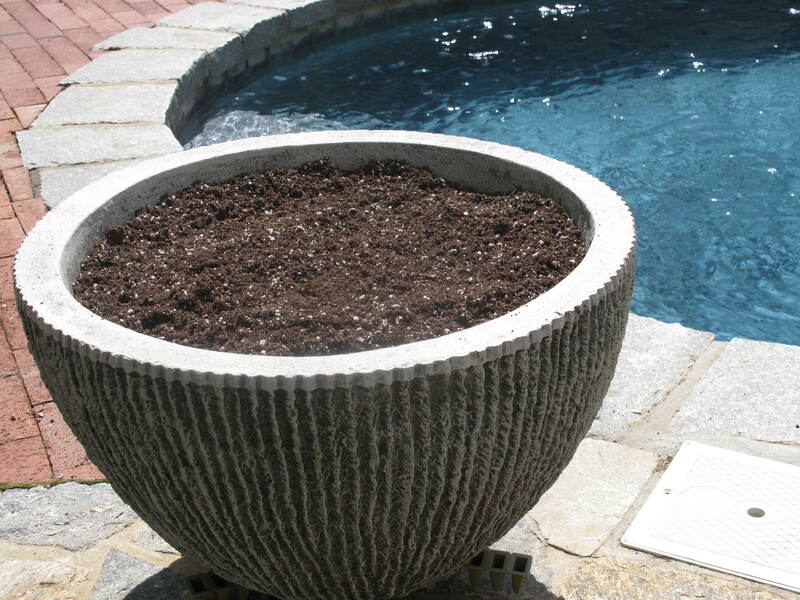 It is one of a set of planters that are new to our collection. I had to have this set because I am in love with faux bois finishes, which is French for “false wood”. A fitting name for items that appear plucked from the forest, but are actually made of cast stone, cast iron or cement. Faux bois items can also be painted to have the same woodsy look and feel. 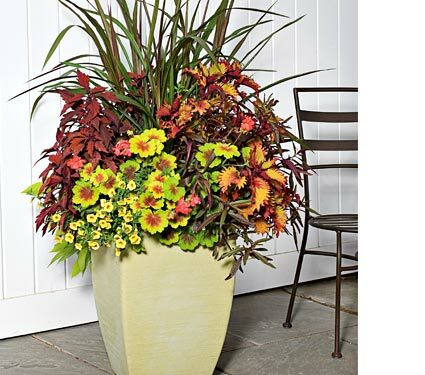 We were struggling to come up with the perfect mix of plants to put inside the pots, but once again, our friends at White Flower Farm, www.whiteflowerfarm.com, were there to help us with our decision. 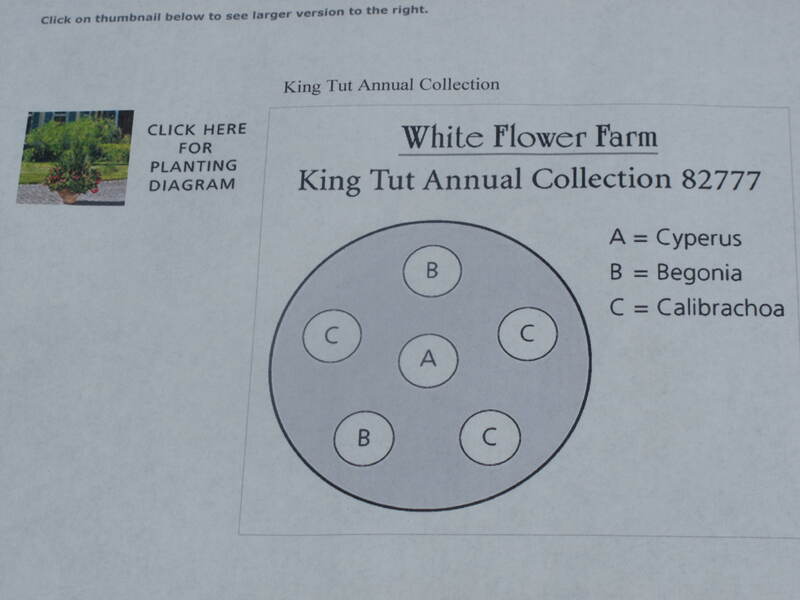 On their website, White Flower Farm has a large assortment of annual collections for sale. All you need to do is find the assortment of annual plants that you like and they will send them to you along with relevant planting instructions. Their instructions even tell you where to position each plant in the pot that you will be using. 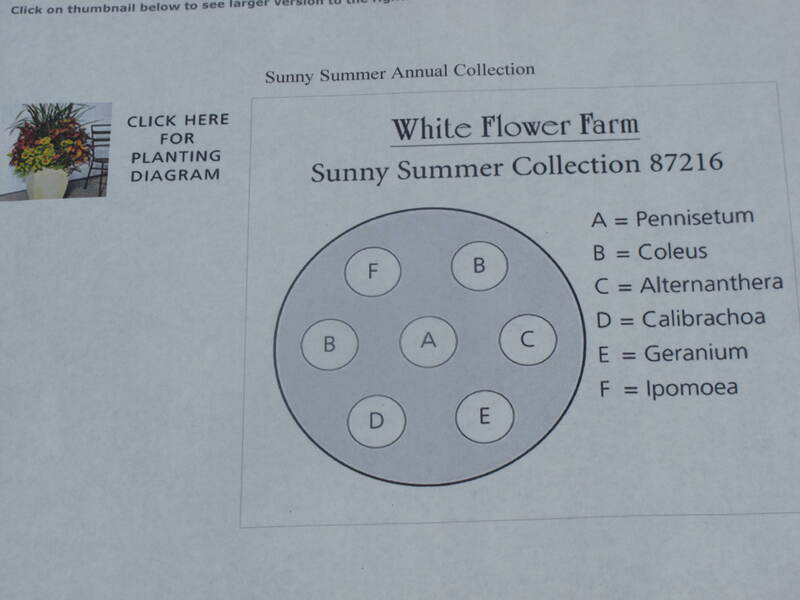 There is little room for a mistake when you purchase one of White Flower Farm’s annual collections. Since our faux bois pots are going along the swimming pool, we decided to select a collection that is a little more on the exotic side. 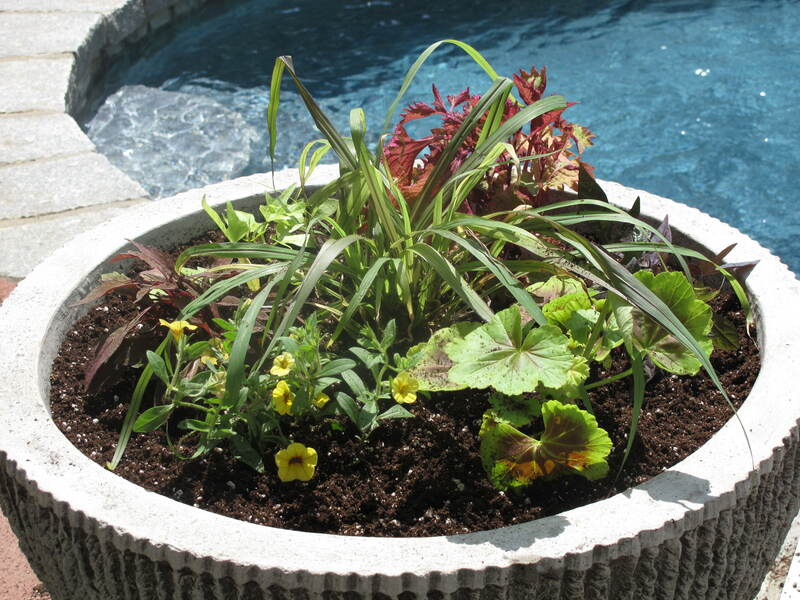 Something that contained some large, tropical looking plants mixed along with more traditional plants like begonias or coleus. Our first selection is named the ‘Sunny Summer Annual Collection’. In this collection, the plants include an Ornamental Grass (Pennisetum purpureum ‘Princess’), a fancy-leaf Geranium (Pelargonium ‘Indian Dunes’), some unusually colored Coleus, Henna and Lancelot Velvet Mocha, a dark-leaved Ipomoea ‘Blackie ‘, a long-blooming Calibrachoa superbells saffron and a trailing Sweet Potato (Ipomoea sweet heart light green). Here is a copy of the detailed planting instructions, what the collection should look like at maturity and what the collection looked like after we finished our planting. Our second selection was the ‘King Tut Annual Collection’. 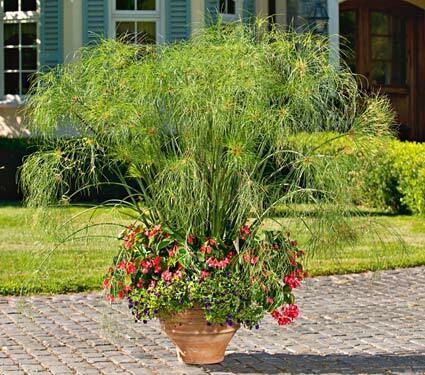 Ancient Egyptians used the leaves of Cyperus Papyrus to make paper, but here that sedge’s foliage creates a sensational display, rising 4-6 feet tall above the trailing blooms of Begonia Dragon Wing Pink and Calibrachoa Cabaret Deep Blue. Again, here is a copy of the detailed planting instructions, what the collection should look like at maturity and what the collection looked like after we finished our planting. So, as you can see, there is a lot of growing that needs to get done in a rather short amount of time. With some regular watering and fertilizing, we should be able to grow these pots into some eye-catching arrangements just like the pictures above that show the collections at maturity. 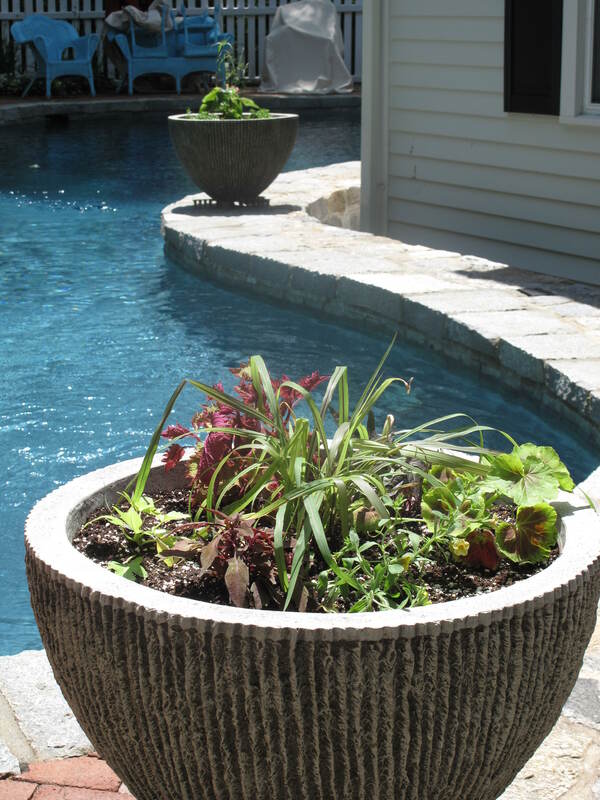 Nothing is guaranteed, but gardening in planters and pots is pretty risk free….and legal. 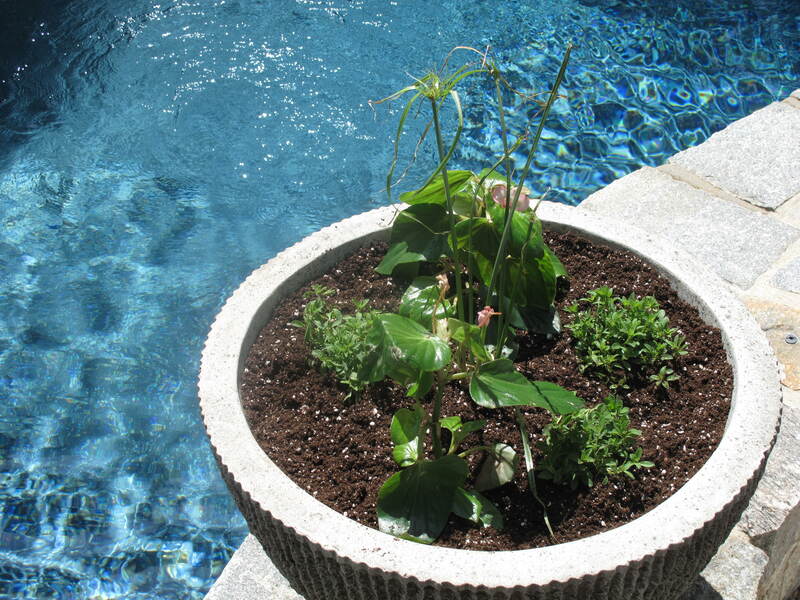 What are you planting in pots, planters and containers on your patio, yard or garden? This entry was posted in The Garden-2011 and tagged Acorns, Beauty, Blog, Family, Fun, Gardening, Humor, Life, Love, My Life, Nature, Photos, Spring. Bookmark the permalink. This is perhaps the first gardening posts to make me want foie gras. The terms don’t even sound alike! But you know me and food. I like how regal the names sound! Hi Rufus’. How cool would that be to eat foie gras sitting beside the faux bois pot.